that still breathes in Greece. 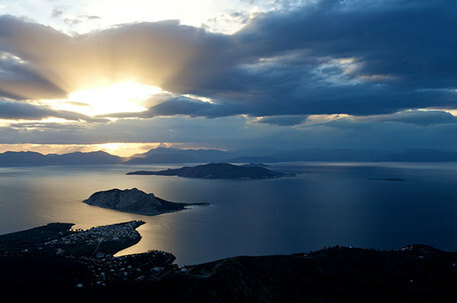 The island of Aegina is truly charming. Its wide horizons offer days spent at the sea on the beaches, and evenings enjoying the atmosphere of lively tavernas and cafés. The port, just four kilometers from the Oikia, is fronted by beautiful neoclassical houses whose balconies overlook the harbour and its vibrant local life. "Zorba the Greek" was written here by the famous author Katzantzakis, who chose Aegina as his home from 1931 to 1946 – contributing to the aura of its intellectual, artistic and cultural life. He wrote, in 1933: "Divine are the days here…". * The temple of Aphaia, was built at the time of the Parthenon, and is a short trip from the Oikia. 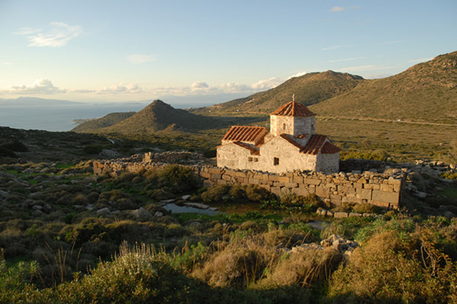 * "Chrissoleontissa", the Greek Orthodox monastery is perched high in the centre of the island. * At the foot of the valley is Aegina's highest mountain with the remains of a sanctuary to Hellanios Zeus, and a tiny chapel - with 1,000 year-old olive trees. * A beautiful and ancient grove of 2,500 year old olive trees, that participants will have the chance to hike into.